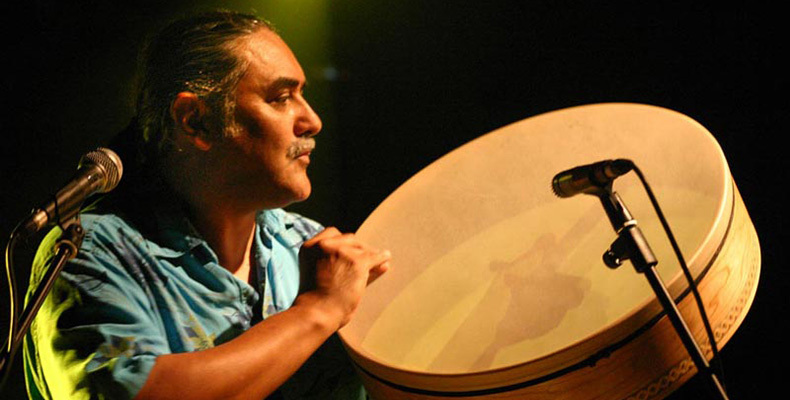 Glen Velez is a frame drum master and percussionist born in Texas, 1949. He is widely regarded as the founding Father of the modern Frame Drum movement and is considered a legendary figure among musicians and audiences world-wide. He has won various awards from many percussion societies, and four Grammy awards for his many recordings. He has collaborated with, among others, Steve Reich, the Paul Winter Consort, Suzanne Vega, Maya Beiser, Tan Dun and Pat Metheny. He received his training from various private teachers and from the Manhattan School of Music in New York City, and is currently a full time musician and music educator. Listen to the World.net is very happy to present you this interview session we had with him several weeks ago, on the subject of his art, and the future of Frame Drums and Music in general. Please enjoy. The Frame Drum movement continues to grow, there are several organizations in the US and Europe which are devoted to promoting interest. When I began to study frame drums, I didn’t know there would be so much interest and thought of my studies as an adjunct to my percussion career. Gradually I began to see how I felt very creative on these instruments and focused more and more of my energy on learning more and trying to use the frame drums in all kinds of musical situations. Eventually I began to play exclusively on the frame drums. Can you elaborate why you “chose” frame drums as your primary media in creating music and culture? Can you tell us a little about the instrument’s origin? I didn’t consciously chose frame drums, it was a gradual process of becoming aware that these drums gave me the most satisfaction of all the percussion instruments. I also became interested in the history of these drum and found that they are the most pictorially documented of all drums. 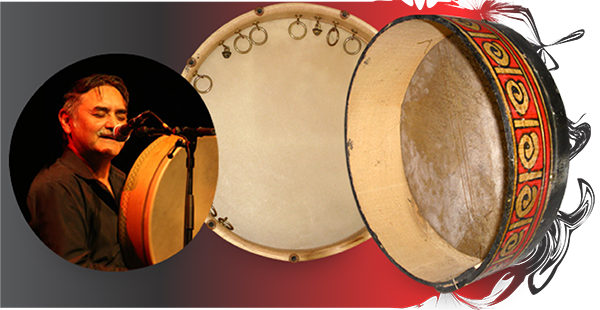 Since they were the most popular drum in the ancient Mediterranean world, there are extensive visual representations of the frame drum in Ancient Egypt, Iraq and all over the Middle East. Finding these pictures gave me a strong feeling of connectedness to the frame drummers of the ancient world. Their legacy is what I want to revive. In the Western World there has been a 2000 year pause in the popularity of these drums, so my role is to assist in the re-emergence of this wonderful drum. How do you think the young perceives and practices percussion instruments today? Even though for most kids the mass media is very influential, I do feel there is a powerful movement among the young to seek out authentic experience in music. That means participating in and sharing the act of playing a musical instrument. The frame drum is a excellent candidate for this experience because it is very portable and user friendly. Each player starts to quickly discover a unique voice in the sound of the frame drum. How does the future of music look like to you? I think the overuse of electronic media will lead people back to acoustic instruments. I don’t know how long that will take, but I think it is just a matter of time. You of course have adventured to almost all corners of this world, and you have sought knowledge and inspiration from music the world over; can you mention some of those places you have traveled to that have impressed on you the most? In my travels I have most enjoyed wilderness areas. They provide me with a lot inspiration for my music. In other words the sounds and sights of nature are a big aspect of my creative world. I visited the Grand Canyon in the US several times, Lake Baikal in Siberia, Easter Island in the Pacific, copper mines in Sweden, and the rivers of French Brittany have all been highlights of my travels. And how do you delve into these very local music and have made them “your own” without it seeming like an inferior copy? I have always regarded traditional music as sacred musical source material. If music is approached with an attitude of respect and reverence, then creativity can flow and change can be accommodated without rancor. But it is necessary sometimes for traditional musicians to object to change. This tension between the old and the new is simply a part of the natural cycles of life. You are also involved in music education, can you tell us what problems it faces? And how do you go about these problems? I incorporate teaching into my creative process. Only when I feel that I am learning does my teaching feel successful. For the student/listener to appreciate the nuances of frame drumming, a taste of the experience of playing is very important. So teaching is part of the whole endeavor of spreading the word about the potential of these drums. Another aspect of my teaching is asking the students to see the spiritual side of frame drumming, by guiding them to an experience of focusing through aligning of breathe, movement and pulse. This is part of the teaching style which I call the Handance Method. People respond very well to this way of learning, since it uses all of their senses and engages them in a new perception of music. The main obstacles for the western student revolve around the challenge of slowing down, getting out of their mind and learning patience. Speaking of technological developments in music creation, with the introduction of music software such as Reason, Cubase, and Sibelius which provide all these possibilities in arranging and composing songs today, in your personal opinion what are the benefits of these methods in the musical process? I use Sibelius in the writing of music, but only when it is not possible to use simple hand written notes. You have produced several musical creations through the media of plates, CD, and digital (mp3), which have often been categorized as “world music.” How do you respond to this? Do you personally agree with this “world music” term? Since it such an ambiguous term, i don’t mind it. It could really mean anything you want it to. Labeling is an ever-present part of the commercial side of music, so I try to see the humor and usefulness of these terms. Describe your music; what does music mean to you? What is your music all about? and who influences you or your music the most? My music is an attempt to create a sound world where the frame drum and voice are the generators of all the important architecture of the music. So the most important influences of my music are the sounds and rhythms generated by the connection between the drum and the voice. Another idea which keeps emerging in my music is the interplay between fast and slow. That relationship creates tension, release and all the nuances in between. You have collaborated with many world class musicians, would you explain one or two events in which you gained great experiences? 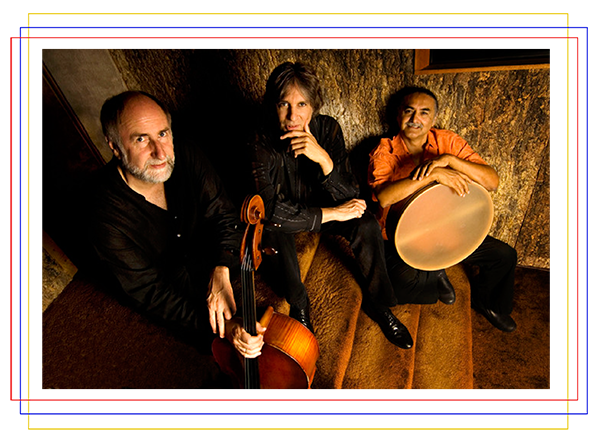 I play in a Trio with Howard Levy and Eugene Friesen called Trio Globo, they are both great musicians who have influenced me in my approach to ensemble playing by showing the power of selflessness in music making. My duo with vocalist Lori Cotler also has had a major effect on my musicianship. She is a very versatile and gifted improviser and and her connection with the pulse and the related manifestation of pitch, is very inspiring to me. You are now living in New York. What is the “New York sound” like nowadays? And do these sounds affect you in your music making? Because I travel mostly to play music, New York is not so much an influence on me currently. In the past New York has been very important to my musical development, because the variety of musical experiences and the tremendous number of small villages of musicians from all over the world allowed me to explore frame drum music in a practical way by actively playing and performing while I was learning. You came to and performed in Indonesia once; what kind of Indonesian music that you are familiar with? And what do you think of it? Gamelan music has had a profound effect on my sound world. It taught me about the musical effectiveness of the fast and slow web of relationships. You participated in an event that Sacred Bridge Foundation organized; would you do it again? Any words for www.listentotheworld.net? I would greatly enjoy participating in another Sacred Bridge Foundation event, since my previously experience was so inspiring. My experience at the Sacred Bridge Foundation Festival was a highlight of the year 2000. I was able to play for a new audience and hear some great music from different places. It was a wonderful chance to play my drums in a very receptive culture for drumming and music. While I was there I got to go to Ubud and hear some beautiful Gamelan Orchestras. I feel that www.listentotheworld.net is a true representation of your organizations mission and serves in a exemplary way, the powerful message of musical inclusion and acoustic expansion. I feel a kindred spirit in the work that you are doing and I am very happy to be a part of the healing trajectory of music. Thank you very much Mr. Velez for your time, your kindness in taking this interview, and most of all, your contribution to music. It’s my pleasure to contribute to your important work and I look forward our next meeting. This is my very first introductional to Glen Velez, what a cool guy! Gotta need to check out more for his works. And yes, I was agree for his statement “The overuse of electronic media will lead people back to acoustic instruments.” It could happen. As an amature musician and also an amature music listener I felt like these days we need something new to representing these times (era). And maybe it could be an acoustic instrument.. Very inspiring, thanks for the work of art!